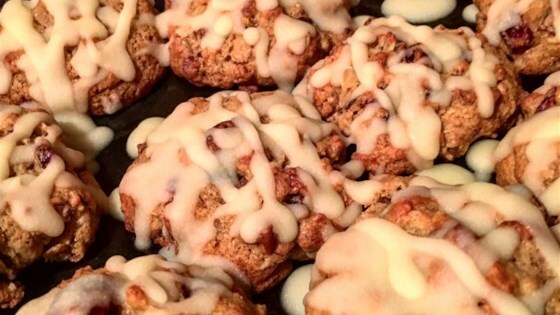 "Cranberries, oats, pecans and orange glaze. So good!" Preheat an oven to 375 degrees F (190 degrees C). Sift the flour, baking soda, and salt together in a bowl. In a large bowl, beat together the butter, white and brown sugars, and vanilla extract with an electric mixer until the mixture is creamy and well blended. Beat in eggs, one at a time, and then gradually beat in the flour just until the mixture makes a soft dough. Stir in the pecans, rolled oats, and cranberries, and drop by heaping spoonfuls onto ungreased baking sheets. Bake in the preheated oven until the cookies are set and the edges are slightly brown, 10 to 12 minutes. Let the cookies cool for 1 minute on baking sheets before removing to wire racks to finish cooling. Glaze cookies while still a little warm. Place the confectioners' sugar and orange juice in a microwave-safe bowl, and stir to dissolve the sugar. Stir in the orange zest and butter, and microwave on medium power until the butter melts and the mixture is warm, about 30 seconds. Stir the warm glaze until smooth, and drizzle over cookies. these are absolutely delicous cookies!! we were making them to take to a holiday party and loved them so much we had to make another batch for ourselves the next day! I changed the recipe by adding the orange zest and some orange juice to the dough and omitted the glaze. These were a big hit and were easy to store.